Meet Our Athena Summer Interns! 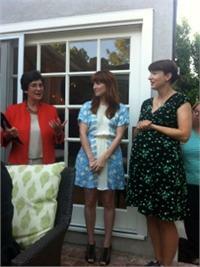 On June 19, 2012, the Athena Film Festival held a wonderful cocktail reception in Los Angeles at the home of festival co-chairs Diane and Jon Levin. Kathryn Kolbert and Melissa Silverstein, co-founders of the Festival, welcomed over 50 people from the film industry. They presented 2012 Athena Awards to three honorees who could not attend the Festival in February, including Academy-Award winner and festival co-chair, Diablo Cody (Juno), writer and director Lorene Scafaria (Seeking a Friend for the End of the World) and Director Dee Rees (Pariah). Festival Co-Chair, Debra Martin Chase was also in attendance to help us celebrate and spread the word about the Festival. Click Here To Learn More About the Athena Film Festival. For two weeks in June, Wellesley College hosted the first Women in Public Service Project’s Summer Institute. The pilot institute brought together 50 emerging women leaders between the ages of 25-45 who are currently serving in different fields of public service and/or political or elected office. 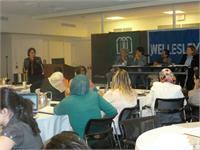 All of this year’s participants were from the Middle East and Northern Africa. On Friday, June 15, Athena Director, Kathryn Kolbert, served as a panelist in a discussion titled, Women’s Rights as Human Rights. Other panelists included: Hina Jilani, a human rights lawyer in Pakistan; Dorothy Harbeck, an Immigration Judge with the U.S. Dept. of Justice; and Meryl Frank, Former U.S. Ambassador to the UN Commission for Women. Jilani began the conversation telling delegates about honor crimes in Pakistan and how prosecution of offenders has changed. Kolbert, who started her career working with survivors of domestic violence cases, talked about ways to make domestic violence an issue and spur legal reforms. Meryl Frank spoke to delegates about using their influence as local officials to bring about change. The participants then held a lively and inspiring conversation about their experiences with violence, the impediments to reform, and ways to bring attention to the conditions women face in the region. The Women and Public Service Project was developed by a founding partnership of the five leading women’s colleges: Barnard, Bryn Mawr, Mount Holyoke, Smith and Wellesley and the U.S. Department of State. This summer, the Athena Center is fortunate to have the assistance of five full-time Barnard student interns who are doing a remarkable job on a host of projects. Ailee Katz, Lulu Mickelson, and Eliza Rosen are conducting research, writing reports and helping to augment our scholars and professional development programs. Julia Kennedy and Charlie Gillette are working on the Athena Film Festival, scouting and previewing films. Many thanks for all their help.